Oil and mixed media on cardboard, framed. Oil on board, with frame by artist. Wayacon in Cienfuegos, Cuba. February, 2000. Wayacon in Cienfuegos, Cuba. November, 2003. 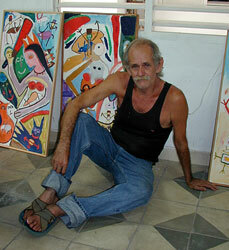 His work has been exhibited in the United States as well as in Cuba. (Thanks to Gerald Mouial for the above quotes from Magic Art in Cuba).